Jordan, last year, you almost pulled off the impossible with a Sunday final round of 64. Climbing back from a nine‑stroke deficit to finish in third, only two strokes off the lead. What does it feel like, how do you describe the feeling of playing in the final round of a major that well? 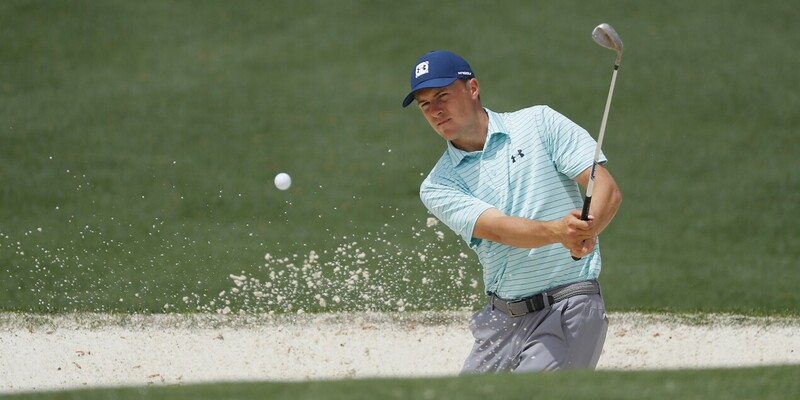 JORDAN SPIETH: You feel an energy behind you when you start to, like a groundswell. Most of the time I've played really well in the final rounds, I've been at or near the lead, and it's been—it hasn't been like a super‑low round but an appropriate round, given the situation, to play the course the right way. But last year here was the first opportunity I've had at Augusta to just fire at every single pin with no consequences, and it was a lot of fun on Sunday. Now, I'd much rather be in the scenario I've been in the previous four years, but it was a blast. I mean, I could feel—I wasn't scoreboard watching, but I could feel the crowd and I could feel a presence there, an energy behind my back nine, as I started to make a move, I felt the aggressive plays easier. I just felt a lot of freedom. It was just a really fun round to be a part of, and came up just short but I don't look at the final round as coming up just short. I look at that as just another great memory here at Augusta. JORDAN SPIETH: Well, it's my favorite tournament in the whole world. I've said that in here quite a few times. It has been since—it was kind of a big reason why I fell in love with the game of golf, when I was playing a bunch of sports, and one of the reasons being, I was just not that very good at the other sports. But I also took a love for this—this game, because of this tournament. I think it was in 2005 when Tiger chipped in there on 16 and just seeing kind of the creativity and imagination on that shot and that win, and just the history of the tournament itself. They aren't any different. My expectations are high this week. I feel great about the state of my game right now. I feel like my recent results aren't a tell of where my game is actually at, and I feel I've made a lot of strides in the last couple days in the tee‑to‑green game, really just off the tee, my long game, which has been the only separation from being able to win golf tournaments over the last month or so. I think there's less strategy when it's softer, but I don't think that it changes. And I've played it soft, and that was the year I won; it was pretty soft in, I want to say, 2016, it was pretty soft, as well. Then 2014, I remember being really firm, and then I think 2017 was on the firmer side, too. It requires I think a little bit more strategy when it's firmer, but in those events, in the years that I mentioned—I mean, last year was a bit softer and if you look at the leaderboards, I don't think it makes a difference on what you're saying. I think either way, you just have to step up and play some really good golf. A putt intimidating out here? If you're right of the pin on 15, to really any of the hole locations, except that back right—but it's hard to be right of that—but that's about as quick as it gets out here. Can you repeat the first part of your question? I'm sorry. Maybe. I've come in here twice after missing cuts in the week before and been in the last group Sunday. I think the two years I finished second, I missed the cut the week before, which is a little bit unusual, but I wouldn't have said coming in those weeks that I was playing particularly bad. I think it was kind of a fluke the week before, versus this week. And then to answer your question, it's very rare, I probably should watch it more often. Last night they were doing a replay on the Golf Channel, and 2015 was on and my dad came over and I was just over hanging watching the pre‑National Championship game, and he said, 2015 is on, do you want to watch it. I said, sure, you can turn it on. We were playing cards, it was just on in the background. It was really cool to relive, especially the final—I think we picked it up maybe Saturday—and it was fun to relive some of those shots and some of the putts that were holed. Yeah, I think because it requires such precision, that even the most basic things can get off, and when you nail them in as much as we nail them in, that could make things worse. Practice doesn't always make things perfect in this sport because sometimes you actually need to figure out what you need to be working on. I think it is, because you never really relied on much roll on that tee ball, anyways. It's really hard. It's become—between there and 11, I may even consider 5 a more difficult hole now. I would have said 11 is the toughest hole on the course prior to the new No. 5, but it's just, you know, if you take the bunkers out of play by hitting 3‑wood, like I used to; now you're just pushed back another 30 yards or so, 35 yards from the green, and so it's 3‑wood, 4‑iron or hybrid, or you can try and hit driver and the bunkers are essentially a penalty stroke, and you still have a mid‑iron in. Yeah, I think especially with their road this year, just the close games, the three free throws over Auburn, they were down to the 16‑seed by like 12 points or something, or 10 points in the first game, and then they were down to Oregon I think a 12‑seed in the second half. To have that happen the year before, and then kind of—I think that first game was big for them because they felt down again in that same situation and they could have panicked, but they played with this kind of poise and patience believing in their ability over who they were playing and they ended up winning by 20 or something like that. I guess so. It's difficult because it's team sports, and there was some turnover, right, some people graduate and new guys come in. There wasn't the full scar tissue from the same team as the year before, but certainly those upperclassmen would have been feeling that kind of redemption that I guess I can relate to a little bit. But you know, for me, it's just different. No, I think people understand that you know, not to try and tap into what your work is, it's not like I'm going into somebody's job and telling them how to do it. So I don't really have people coming and telling me. I'm sure there are, like if I check direct messages or something, that there would probably be plenty of experts telling me what's going on. But I mean, you know, I don't pay attention to that. You have to fall in love with the process. Like that's the idea. It's very difficult to do. It's very difficult to have patience. Especially, I'm not a very patient person, so it's very difficult at first, but once you realize what you need to do to fall in love with that, then you start finding that kind of the way that you picked up the game in the first place and the changes you used to make when you were a kid that you didn't really care much about if it took you six months to a year to do. I mean, I went through that when I switched to Cameron and changed my swing up to be more consistent. You know, sometimes you just have to kind of reset and go through that and fall in love with that process again, but I found myself in more high, like emotional swings, like day‑to‑day, I would be either really upset or super‑pumped and you want to be kind of in the middle of that and recognize it for what it is, and that's just grinding it out and retooling. Yeah, the second part, absolutely. I feel like I've had a career's worth of golf just at five events, five tournaments here. But I would say, like I look at 16 as probably the most clutch putt I've ever hit in my life, and I think, like Justin Rose, if you asked him, he would say that that was probably the most clutch putt that I've hit in my entire life, just being in that situation, understanding, you know, where he's at, what it could mean going forward and just making those last couple holes easier. Certainly, out here, people always talk about it, but your second shot into 13, I mean, the ball is above your feet more than any other shot you'll hit on the PGA TOUR, or any tournament, the whole year, and it's awkward to have to hit a long iron off that and like what ball flight do you play, do you hold it off of it, draw it off of it. So that shot's always definitely different than it may look sometimes, especially when I'm not hitting it 350 yards up there and have an 8‑iron in. You know, when you're hitting 5‑iron in, it's certainly a tougher shot. But the funniest thing about watching it was like seeing how many putts were holed by like Phil or a bunker shot or, you know, putts that were holed, like Tiger gave a big fist pump on one hole. It's just funny like listening to, he makes a big putt and gets to six back. I'm like, wow, that's way up there (laughter). I'm really tearing that place up. Certain guys are like really pumped up about a putt, and it's like, I was just kind of going about my business in the zone that week. Yeah, I think more so, it's more of like being recognized out in—it's almost like constantly, wherever you go, you're the golfer, versus when I was first coming out, it was like, you just wouldn't be recognized, so you just go have dinner with whoever, and you don't even think about anything. You're not famous, I guess. So you just—you just go out and have dinner and don't think anything of it and talk about whatever you want and come back. Now, it may be people come up and ask for an autograph or a picture, and then, you know, someone is sneaking a picture that's sitting at the other table while you're eating, just stuff like that, that changes. But as far as the way I go to bed at night and wake up in the morning and go do my work at home and come out on the road, I don't feel like I've—I don't feel like I've changed as much. I feel like I go through periods of practicing more than others. Sometimes I'm a little more casual with it when things are good; I'll nail what I need to and leave. And sometimes when things are off, you spend extra time practicing and golf is more on your mind because you're trying to figure out how to get it back.